Let’s face it: communication is a critical part of any business. If your staff in your office can’t communicate easily with your technicians in the field, you have a problem. If you can’t communicate with your field techs instantly and they can’t communicate instantly with you when they need you, you can’t run your business at its optimum level. You’ve heard about SMS texting, and you’ve heard about field service management software to automate your business, and you’re looking into both. One of the questions you’ll have to ask when looking into field service management software is: does it have integrated SMS texting capabilities? Until recently, SMS texting capabilities were not built directly into the software – you still had to use your cell phone to communicate with company employees. FieldSurf was the first field service management system that integrated SMS texting directly into the system. When a dispatcher or anyone else in your company needs to communicate with your field techs or anyone else in the company, he doesn’t have to grab his mobile phone – he simply sends an SMS text through FieldSurf. So let’s examine the various facets of SMS texting between your dispatcher in your office and your techs in the field. These are real examples of how FieldSurf’s SMS texting is used on a daily basis in many home service companies. Dispatcher assigns new incoming customer call to field technician. When a new call for service comes in from a customer, the dispatcher consults FieldSurf’s calendar for an available time slot, then consults FieldSurf’s GPS map to see which tech is the closest. He then assigns the call to the desired technician. The technician is then immediately texted with details of the job. Dispatcher needs to advise customer of tech arrival time. 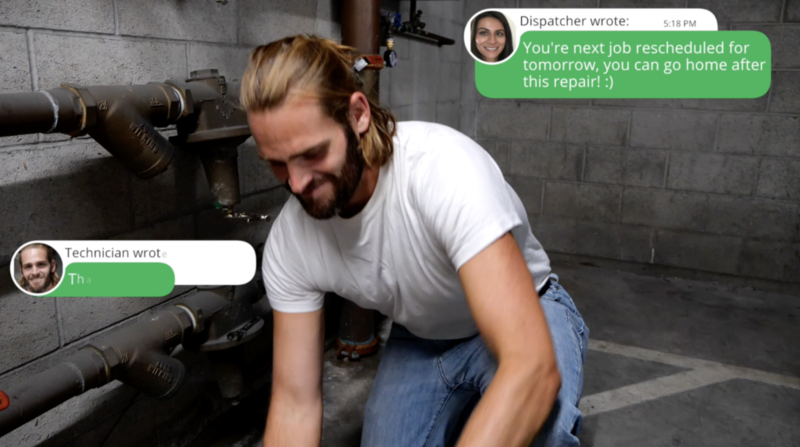 After the dispatcher has assigned the technician to a new job, the dispatcher sends an SMS text from his FieldSurf dashboard to the customer, advising him/her of the technician’s expected arrival time. Customers really appreciate this feature, and so do the technicians, because they don’t have to call the customer. Dispatcher needs to advise tech of customer change of arrival time. If something comes up and the customer cannot make the expected arrival time and needs to push it back by an hour, the dispatcher sends an SMS text to the technician, advising him of the schedule change. Tech can then use that time usefully: to swing by your supplier and pick up parts, or to take a break, or have a Starbucks, rather than sitting outside the customer’s residence waiting for them to show up. Dispatcher needs to advise customer of change in tech arrival time. Sometimes a technician is delayed on a job and cannot make the promised arrival time for the next job. Using FieldSurf, the dispatcher is informed of the situation and immediately sends an SMS text to advise the customer of the new expected arrival time. Customers really appreciate this kind of customer service. Supervisor needs to advise field tech on technical issue. Let’s say that a supervisor has told a field tech that he will help him with the customer’s issue. The supervisor is working on something else, and only wants to be interrupted when the technician arrives at the customer’s premises. The manager will be automatically advised by FieldSurf’s SMS texting when the technician arrives, and the manager can then call the tech and help him resolve the customer’s issue. No time is wasted using phones to text and call to figure out where everyone is. Supervisor needs to advise field tech on customer/billing issue. Let’s say you get a call from a customer after you have already dispatched a technician to that customer’s premises to install a water heater. You talk to your customer, and you decide to provide the installation for free because he is such a good customer. Using FieldSurf, you can immediately SMS your tech before he even arrives at the customer’s location, and advise him not to charge the customer for the installation. Supervisor needs to reroute technician for another purpose. Every service business always has to be ready to take care of customer emergencies. Let’s say you suddenly get a call from a good customer who needs to have his water hearer replaced immediately. You don’t have on hand the fifty gallon Bradford White water heater that the customer wants. So you need to send a technician round to Ferguson’s to pick up a unit of that model and take it to your customer’s place. A simple SMS text through FieldSurf will inform the tech of his assignment. No more time wasted calling people and looking for people all over town. FieldSurf’s SMS texting capabilities are fully integrated into the system, and can be accessed from any desktop or tablet computer, and even from your smartphone. These are just a few of the ways that service companies use the integrated SMS texting feature of FieldSurf. It is a superb communication tool for intra-company communication. You can authorize anyone in your company to access or be forbidden access to any element of FieldSurf. Everyone who needs to be involved with any project on any level can be on the same page, and everyone is automatically texted of all developments in any job until the completion. With FieldSurf, all your staff know what’s going in every department. And as a management tool, FieldSurf is unsurpassed. With FieldSurf, owners and managers can stay in touch with every aspect of the business at all times. You can be sitting in a meeting or at lunch and if a development happens that needs your attention, you are immediately advised of the situation and can take appropriate action. Because FieldSurf can be accessed from your smartphone, you can manage your business and communicate with everyone from anywhere — from your office, if you’re in a meeting, if you’re at lunch, or even at the beach. FieldSurf has a huge amount of features to automate any service business and bring it into the 21st century. It handles your Scheduling and Dispatching, it tracks techs with GPS, it acts as a device for techs to clock in and out, it lets you control your Inventory, and it automates your entire accounting department, providing instant real-time financial reports on anything you need to know. FieldSurf is the only field service management system that has SMS texting integrated into the system. Check out FieldSurf with its amazing SMS texting capabilities and see what it can do for your service business.